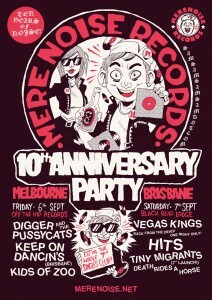 10 years is a long time to be run an independent record label. It is our birthday and we want you to all come party with us! Back in 2003 we were wondering how to release our band’s music without having to deal with a record label… the solution… start a record label. Once the first release came out; “For Those Who Came in Late”, by our band at the time, Vegas Kings we started to get an idea of what we would like to do as a label. Provide an avenue for bands to release music without tying them in to crappy contracts or lose money. We then asked the band we admired the most if we could release their music too and in 1994 The Standing 8 Count’s “Greatest Hits” was released. Since then we have released over 40 titles of local bands including Hits, Texas Tea, Keep On Dancin’s, The Horrortones, El Borracho, Undead Apes, Tiny Migrants, The Dangermen and Butcher Birds. In our 10th year we undertook a dream of creating a singles club. Donating 100% of profits to the Black Dog Institute and showcasing bands that have helped or influenced our label and band’s journey. Now in to it’s 7th month, we have released tracks from Cosmic Psychos, Bob Log III, Spencer P Jones, Sixfthick, Digger & The Pussycats with plenty more exciting surprise releases. To celebrate 10 years of releasing independent music we are throwing 2 FREE parties. Both parties contain bands and musicians that really helped us over our last 10 years. At each event we will have a special guest DJ spinning the entire 2013 Singles Club records as we all a pop up record store and some great giveaways. Please come along, have a beer and continue to support local independent music. © 2019 Mere Noise Records All Rights Reserved.